The future of the global refrigeration oil market is prosperous, with the demand estimated to increment at a CAGR of 5.8% during the forecast period of 2017 to 2025. Some of the key factors favoring the global refrigeration oil market are: increasing preference of low-GWP refrigerants, rebates offered by government and NGOs to promote energy-efficient product and services, technological advancement such as advent of HVAC&R systems in the healthcare sector, and expanding refrigeration application. The transportation sector and new product development by the leading vendors are also expected to open new opportunities in the global refrigeration oil market, which on the other hand is facing obstruction from compatibility issues and complexity of oil control function. The refrigeration oil market is projected to reach a global valuation of US$1.77 bn by the end of 2025. On the basis of product type, the global refrigeration oil market has been bifurcated into mineral oil and synthetic oil. The latter currently serves the maximum demand and is estimated to be worth US$1,314.5 mn by 2025. This potent demand for synthetic oil can be attributed to its compatibility with refrigerant used in the system. On the other hand, the mineral oil offers more benefits over the synthetic oil, which leads to its use as a thermal fluid in mechanical and industrial applications. Polyol ester, ploy alpha olefins, alkyl benzene, ploy alkylene glycols, polyvinyl ether and phenolpropoxylate oil are some of the other types of refrigeration oil. Based on refrigerant type, the global refrigeration oil market has been segmented into hydrocholoroflurocarbon (HCFC), chlorofluorocarbon (CFC), hydro fluorocarbon (HFC), and ammonia. By the end of 2025, hydro fluorocarbon segment is estimated to be worth US$476.1 mn, which is considerably more than any other segments. However, ammonia is anticipated to experience the best CAGR of 6.2% during the forecast period of 2017 to 2025. Application-wise, the global refrigeration oil market has been categorized into air conditioner, coolers, chillers, refrigerators, and condensers, with air conditioners contributing the most prominent chunk of the overall demand. By 2025, the air conditioners category of the global refrigeration oil market is estimated to be worth US$535.3 mn, expanding at a strong CAGR of 7.7% during the said forecast period. Based on end-use, residential and commercial sectors serve the maximum demand, with residential segment projected for an above-average growth rate. The developed country of the U.S. continues to be the main consumer of refrigerant oils, owing to high demand for refrigerant based products such as air conditioners, residential and commercial refrigerators, and medical freezers. 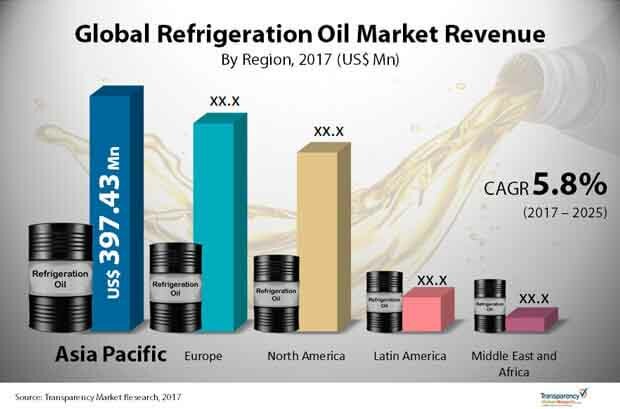 The North America refrigeration oil market is also driven by the increased demand for food storage equipment, growing urbanization, and growth in the consumer electronics market. With increasing usage of air conditioners and refrigerators, there will be augmentation in the demand for high performance and longer life of these systems. Since these oils add long life to the refrigerant systems, the market for the same will flourish consistently. On the other hand, the Asia Pacific region is the major shareholder of the global refrigeration oil market, accounting for more than 35% share of the overall market. This is a reflection of the presence of numerous refrigerants and refrigerant oil providers and end user sectors. The APAC refrigeration oil demand continues to be high due to emerging markets such as India and China, which are projected to grow significantly in the cold storage warehousing and frozen food sectors. The global refrigeration oil market is concentrated among five major players, viz. Idemitsu Kosan Co, Ltd., Royal Dutch Shell plc, BASF, Exxon Mobil Corporation, and MEIWA, who collectively accounted for 94.8% of the market in 2016. These companies have a strong product portfolio as well as presence in a number of countries, and are expected to maintain their dominance in the near future too.